Want to get found by more customers in your area, rank higher on Google and get more leads? Our small business SEO plans will get you there. SEO or Search Engine Optimisation is the name given to activity that attempts to improve a website's search engine rankings in the list of Google, Bing & Yahoo search results. The higher up your business appears, the more leads you're likely to get each month. Why should you manage mine? There are over 200 factors that search engines consider when ranking your website against the billions of other websites out there, and it doesn't help that these are changing every day. Smart Little Web are experts at staying on top of Google's ever changing criteria, and we'll be able to apply that to your website as and when it's needed. Couldn't I do it myself? Of course you can! There are tonnes of things you can do right now to optimise your website for search engines. But SEO is a long game, and you need to stay on top of it 24/7 to make sure your website is always performing. We're here to save you that time. "The SEO is fantastic! I get constant new enquiries through my website. I rank number one on google in my area, which is amazing. I had more new enquiries in my first week with SLW than I had in the 2 years I was with other providers." What's the real value of good SEO? Dog lover, Patsy, runs her Able Groomers dog grooming business in Hampshire, and has seen huge growth in the amount of new enquiries coming directly through her website. 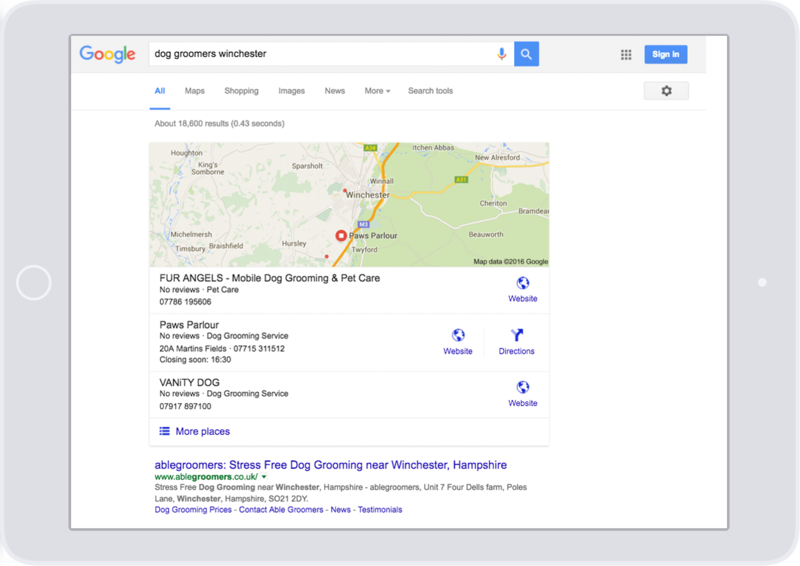 Since launching her website with Smart Little Web, we've achieved the very top organic position on Google for her desired search term 'dog groomers winchester'. Fancy a little something on us? We're passionate about every single small and local business having a professional web presence that works hard for them, and SEO is one of the top ways of doing this. We've created a free guide of 7 easy SEO tips you can action right now to help improve your website's search ranking.